West Side Story (1961): Directed by Robert Wise and Jerome Robbins. Written by: Ernest Lehman. Lyrics by Stephen Sondheim. Music by Leonard Bernstein. Based upon the stage musical of the same name with lyrics by Sondheim, music by Bernstein, and book by Arthur Laurents. Starring: Richard Beymer, Natalie Wood, Russ Tamblyn, George Chakiris, and Rita Moreno. Unrated. Running time: 152 minutes. Boasting an impressive pedigree (Sondheim and Bernstein?!? 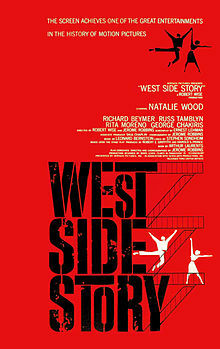 ), West Side Story rejuvenated the movie musical with operatic numbers belted out by street hoods. More so than the musicals we’ve thus encountered, West Side has it both ways: seasoned melodrama and observant social commentary. Our story transposes Romeo and Juliet to the streets of New York, with the Latin-American “Sharks” as the Capulets and Polish-American “Jets” standing in for the Montagues. When Tony the Jet falls for Maria, sister to the Sharks’ Bernardo, it sets in motion a chain of events leading to turmoil and inevitable tragedy. And don’t expect any last-minute happy endings. The film succeeds because it doesn’t simply throw songs and dancing into a pre-existing story—rather, music and choreography are essential to its vision. Bernstein’s score proves extensively satisfying, with moments both epic and tender. Sondheim might still have been honing his craft, but he carefully analyzes gang violence and racial tension (“Gee Officer Krupke” introduces several theories for juvenile delinquency, before rejecting all of them). And Jerome Robbins’s choreography is outward and swanky, arms and hands outstretched, as if the characters keep reaching out for something intangible. Director Robert Wise holds it all together, making a network of narrow streets feel as expansive as a kingdom. And he coaxes genuine performances from his cast—particularly George Chakiris as Bernardo, who flits between sinister, charming, and vulnerable. Wise sometimes threatens to sentimentalize key moments in the story, but also brings a level of irony to the familiar doomed romance. I might have enjoyed the film even more if it had expanded its characters—geunine as they are. And perhaps Wise might have brought out the dirt and grime of the inner city to complement the stylized choreography. Still, West Side proves that musicals can offer much more to moviegoers than pure escapism.